Already one week into the MLB season, the defending AL East champion Boston Red Sox have taken an early lead in the division. This season promises to be a battle between the Red Sox and Yankees, as the “Bronx Bombers” reloaded with the best home run hitter in the league, Giancarlo Stanton. With the highest payroll in baseball, Boston looks to prove that paying big time players yields championships. The Red Sox pitching staff is led by two Cy Young winners (David Price and Rick Porcello) and Chris Sale who is coming off a 300 strikeout season. “Good pitching always beats good hitting, so if the Red Sox staff can dominate like they all have in the past, Judge and Stanton won’t stand a chance,” said Sabrina Robbins. “This pitching staff has the potential to dominate the American League, but they need to limit Sale’s innings because last season he just lost all his steam in the playoffs,” said junior Alex Diaz. “For all the money the Red Sox have sunk into pitching, they absolutely need to perform at a Cy Young level,” Diaz added. Other contenders in the American League include the reigning World Series champions Houston Astros and AL Central champs Cleveland Indians. However, some feel that the dark horse team in the AL is the LA Angels. 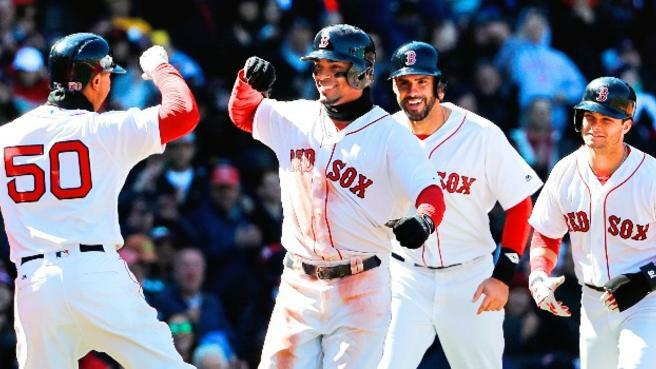 This season promises to be an eventful one for the Boston Red Sox with the goal of winning a World Series, but consistent hitting and dominant pitching will be key if the ‘Sox’ want to get back to the top of the MLB mountain.